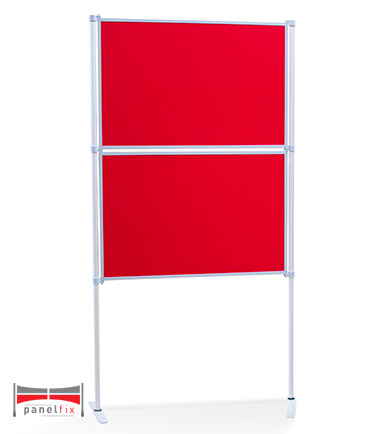 The PanelFix Display Boards provide a comprehensive solution for creating effective and prominent displays. These are composed of lightweight panels which are then completed with silver aluminium framework and stabilising feet. Through years of working with clients from a range of industries, we have developed the PanelFix Display Boards to be as effective as possible while offering them at the best possible price. Each aspect of the PanelFix Display Boards are designed to help it excel in areas with a moderate amount of footfall. So whether they are intended to be used at exhibitions, trade shows, art exhibitions in schools and more, the PanelFix Display Boards are equipped to create a professional display. They have the added feature of a loop nylon fabric which means content can be applied using hook & loop dots and tape as pins are no longer required. The design of the PanelFix Display Boards right the way through to manufacturing takes place at our site in Peterborough, Cambridgeshire. All orders can be customised as PanelFix Display Boards can be personalised with different fabric colours, a carry bag or with a selection of accessories, each designed to enhance the appeal and practicality of the display.